Definitely not exact, but close enough. This is one of my Tulpas. She named herself Azure. 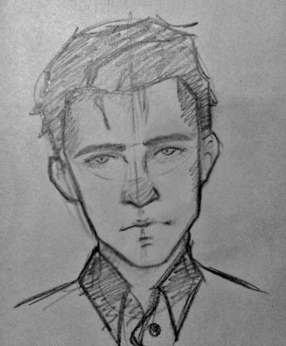 Drew this around the time Scandroid's Monochrome album came out. This is still one of my favorite pictures that I've done. Here's a simple drawing I made of my tulpa Sunlight Flare. I've also drawn her without makeup or clothing, in order to keep a basic form as a reference, but this is the way I always visualize her. I'd like to make more complex drawings by adding shadows, more detail, a different style and more poses and angles. I'm hopeful of improving my drawing skills in the future because I really like drawing her. Hello! I'm kind of new here and i'm very shy about my relationship with Carolyne (my tulpa) but she is so fond of me whenever i draw her that we decided it would be nice if we posted my best attempts at portraying her over here! She has two forms: her normal female form (featured here) and a (for a lack of a better word) "very fit" form. We really like the "classical vibe" of those ancient fullbody sculpures and portraits that you see every once in a while so that's why she's naked. (03-21-2018, 02:38 AM)Misterious_Human Wrote: Hello! I'm kind of new here and i'm very shy about my relationship with Carolyne (my tulpa) but she is so fond of me whenever i draw her that we decided it would be nice if we posted my best attempts at portraying her over here! My latest drawing of me and Benji. He’s not in his usual clothes in this pic but it was on a casual day. Sooo... yes. I finally decided to draw him, and it was so exhausting (I paid too much attention to the details and ALMOST forgot to enjoy the activity), but fun at the same time. I'm pretty much satisfied with this sketch, as it's quite accurate and represents his features well enough. I've actually made two sketches, but the second one was getting on my nerves. There were problems with anatomy and likeness, so I'm not gonna include it. Yep! Whew! Greetings from the moon. That's pretty good Bear, but I can't believe you didn't draw yourself with a Bear face inside the spacesuit.